Is Body Size a Biomarker for Optimizing Dosing of Omega-3 Polyunsaturated Fatty Acids in the Treatment of Patients with IgA Nephropathy? Re-analysis of the North American IgA Nephropathy Study suggested that efficacy of omega-3 polyunsaturated fatty acids (ω-3 PUFA) was dosage-dependent on the basis of body size and plasma ω-3/ω-6 and eicosapentaenoic acid (EPA)/arachidonic acid (AA) ratios. The objective of this study was to confirm these assertions. Data from a previously reported randomized 2-yr clinical trial in which two dosages of an ethyl ester ω-3 PUFA (Omacor) were given to 73 high-risk patients with IgA nephropathy were reviewed. Omacor also was used in the North American IgA Nephropathy Study. Parameters included body weight; body mass index (BMI); plasma phospholipid AA, EPA, and docosahexanoic acid (DHA) levels and serum creatinine and 24-h urine protein (UP) levels during the 2-yr trial; and time to ESRD after 6.4 yr. 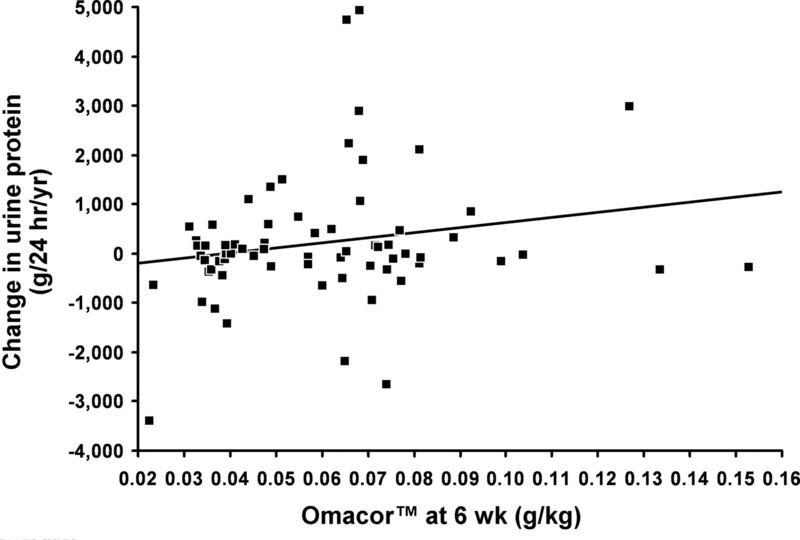 Plasma phospholipid levels of EPA, DHA, and EPA/AA ratios were significantly inversely correlated with increasing body weight and BMI in the Omacor 4-g dosage group but not in the Omacor 8-g dosage group. 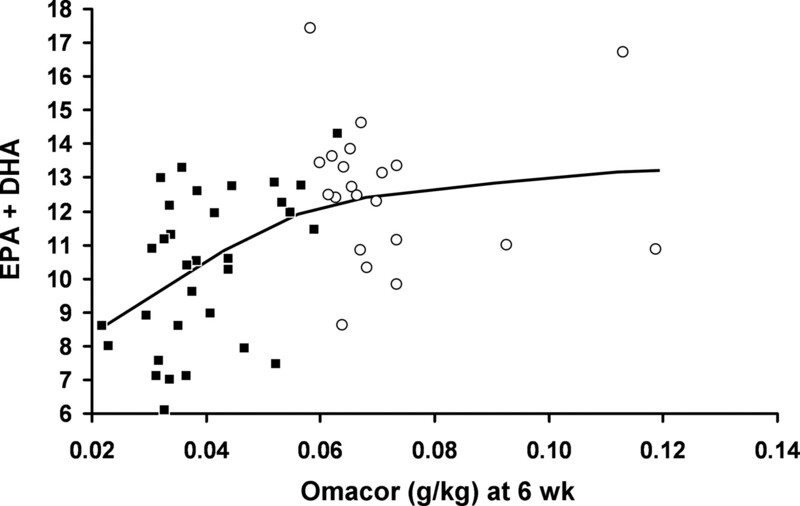 Conversely, increasing levels of lipid parameters were observed with increasing dosages of Omacor (EPA+DHA) in grams per kilogram of body weight at 6 wk of treatment. None of the plasma ω-3 PUFA levels, EPA/AA ratios, or Omacor dosage per kilogram was significantly associated with reciprocal serum creatinine or UP slopes during the 2-yr trial or with ESRD. This post hoc analysis of body weight and BMI, plasma ω-3 PUFA status, and renal outcome did not find that treatment efficacy of ω-3 PUFA was dosage dependent on the basis of body size. During the past 20 yr, the efficacy of dietary fish oil supplementation has been tested in patients with IgA nephropathy with mixed results (Table 1) (1–8). Arbitrarily determined, fixed dosages of omega-3 polyunsaturated fatty acids (ω-3 PUFA), eicosapentaenoic acid (EPA), and docosahexanoic acid (DHA), the essential ω-3 PUFA found in fish oil, were used in each of the reported clinical trials (1–8). A recent study suggested that treatment effectiveness of ω-3 PUFA was dosage dependent on the basis of body size and plasma ω-3/ω-6 and EPA/arachidonic acid (AA) ratios (9). These findings were based on a re-analysis of the North American IgA Nephropathy Study in which the original results showed no significant benefits from ω-3 PUFA in preserving renal function or lowering proteinuria (8). The re-analysis showing that efficacy of ω-3 PUFA treatment is dosage dependent assessed treatment effects on short-term, intermediate end points of changes in proteinuria and renal function in a small subset of 23 patients who were enrolled in the trial (9). The aim of our study was to confirm the assertion that treatment efficacy of ω-3 PUFA is dosage dependent on the basis of body size. We examined the effect of body weight and body mass index (BMI) on plasma phospholipid PUFA levels and dose of ω-3 PUFA per kilogram of body weight and their relationship with renal outcome. This study is based on existing data that were obtained in a previously reported randomized, open-label, parallel-group, 2-yr clinical trail in which two dosages of a highly purified ethyl ester concentrate of ω-3 PUFA (Omacor, Pronova Biocare, Oslo, Norway) were given to 73 high-risk patients with IgA nephropathy (6). This ω-3 PUFA product also was used in the North American IgA Nephropathy Study (8,9). Archived data were analyzed from our previously reported study in which two dosages of Omacor were given to 73 adult patients who had renal biopsy–proven IgA nephropathy and were at high risk for developing progressive renal disease. Patients were assigned to receive daily doses of either high-dosage Omacor (EPA 3.76 g, DHA 2.94 g) or low-dosage Omacor (EPA 1.88 g, DHA 1.47 g). The quantities of ω-3 PUFA for the designated low-dosage Omacor group approximated the amounts of EPA and DHA that were given to patients with IgA nephropathy in our original randomized, placebo-controlled, clinical trial (4) and extended observational study (5). We did not include patients from our original trial in this study because we found significant differences between fish oil and placebo groups that favored the fish oil group, and the fish oil brand varied during the course of the study (4,5) whereas Omacor was used exclusively in the two-dosage comparative trial (6), providing the opportunity to confirm the dosage-dependence hypothesis proposed in the re-analysis of the North American IgA Nephropathy Study (9). Parameters used in this study were retrieved from the existing database and included (1) patient study numbers for those who were randomly assigned to high-dosage or low-dosage Omacor; (2) baseline, 6-wk, and 6-mo body size measurements: body weight in kilograms and BMI, an indicator of adiposity, calculated as the weight in kilograms divided by the height in meters squared (BMI = wt [kg]/ht [m2]; as per protocol, each patient was weighed without shoes on a balance-beam scale); (3) the fatty acid composition of plasma phospholipid for AA, EPA, and DHA at baseline, 6 wk, and 6 mo of treatment (data for each fatty acid were expressed as the weight percentage of total fatty acids and calculated as millimoles per mole divided by 100); (4) renal outcome defined by intermediate end points (continuous variables) of change in renal function (annualized within-patient slopes in reciprocal serum creatinine) and change in proteinuria (UP; annualized within-patient slopes in UP) during the 2-yr trial and the long-term renal end point of time to ESRD at 5 yr of follow-up for each patient treated with low-dosage and high-dosage Omacor. ESRD was defined as the start of chronic dialysis, receipt of a kidney transplant, or when a patient’s serum creatinine level reached 10 mg/dl. Patient selection and patient monitoring are described in the two-dosage Omacor trial (6). New information that was obtained after the closure of the Omacor trial and pertinent to this study was long-term follow-up of vital status, including time to ESRD, through May 2004, that was part of a new study on the influence of the angiotensin-converting enzyme genotype on renal outcome in this cohort of patients (10). Several hypotheses were investigated in an effort to determine a potential dosage effect of plasma fatty acids on renal outcome. The first set of correlations plots plasma phospholipid fatty acid levels by body weight and BMI at 6 wk of treatment. Measurement of plasma phospholipid fatty acids is an indicator of tissue essential fatty acid status (11). An inverse correlation is expected (i.e., higher EPA, DHA, and EPA/AA ratios with smaller body size), whereas AA is expected to be lower because of the known suppression of ω-6 metabolism by ω-3 supplements (12). This correlation also examines the following question: Does a person of larger body size have less of an increase in plasma ω-3 PUFA because of a greater volume of distribution of fatty acids? 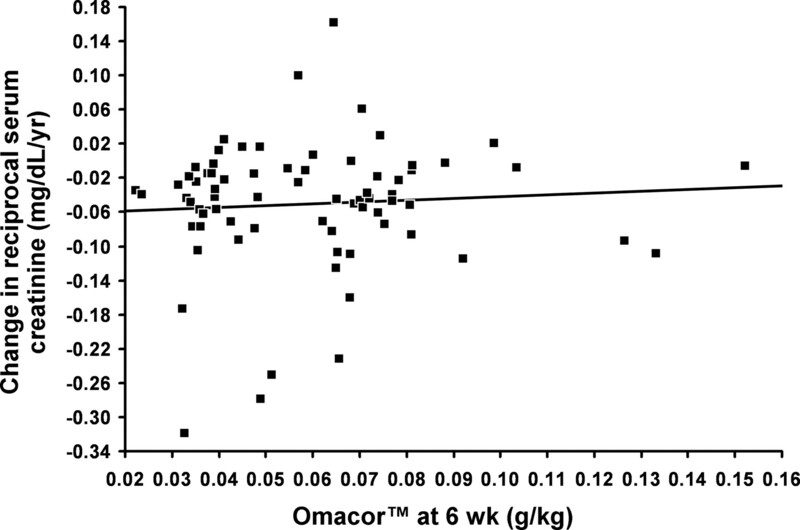 The second set of correlations plots plasma phospholipid fatty acid levels by Omacor dosage (EPA+DHA)/kg body weight at 6 wk of treatment, which examines the relationship between enrichment of plasma ω-3 PUFA and dosing of EPA and DHA according to body size. The goal of this analysis was to investigate the possibility of threshold effect in serum fatty acid levels as a function of dose per body size. That increasing Omacor dosage per kilogram of body weight at 6 wk of treatment is more beneficial to renal function and proteinuria and would result in increasing 1/serum creatinine slopes and improved survival estimates free of ESRD at 5 yr and decreasing UP slopes at 2 yr going from lower to higher Omacor dosage per kilogram of body weight. Data were summarized using frequencies and percentages, means and SD, or medians and 25th/75th percentiles. Treatment groups (Omacor 4 and 8 g) were compared using the rank sum (quantitative factors) or χ2 test (qualitative factors) as appropriate. Trends of plasma fatty acid levels versus body size and Omacor dosage per kilogram of body weight were displayed graphically using scatter plots and smoothing splines (running averages). Associations between the continuous variables and annual changes in reciprocal serum creatinine and UP (slopes) were assessed using simple and multiple linear regression and Spearman rank correlation coefficient. Time to ESRD, by the three groups formed by tertile of dosage of Omacor (EPA+DHA) in grams per kilogram of body weight at 6 wk of treatment, was estimated by the Kaplan-Meier method. The effect of Omacor dosage per kilogram of body weight on time to ESRD was tested using the log rank test (dose/body weight tertiles) and the Cox proportional hazards model (with dosage per body weight tertile as a linear predictor). All tests were two-sided with α = 0.05. Body weight, BMI, total dosage of ω-3 PUFA, and fatty acid composition of plasma phospholipids in the Omacor 4- and 8-g groups are shown in Table 2. 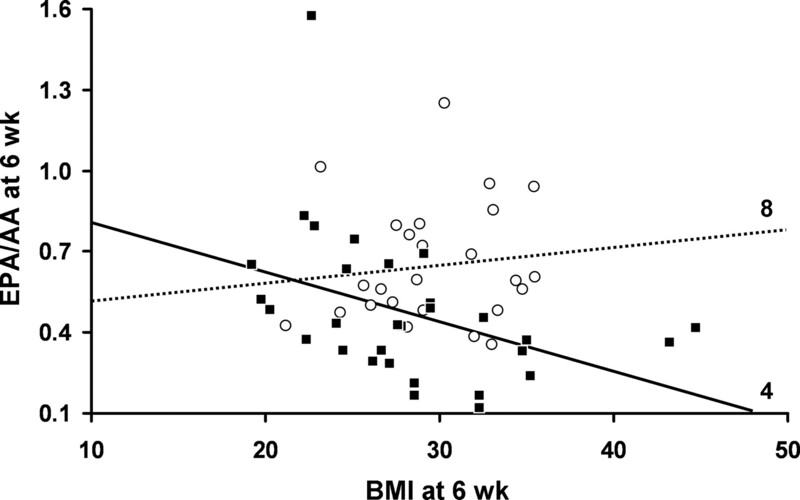 There were no significant differences between groups in body weight or BMI at baseline and 6 wk and 6 mo of treatment. In the 56 patients (30 Omacor 4 g, 26 Omacor 8 g) who were not taking ω-3 PUFA at study entry, fatty acid changes from pretreatment were significant for all measured fatty acids (Table 2). There were significant increases in EPA, DHA, and EPA+DHA and significant reductions in AA levels at 6 wk and 6 mo after supplementation (P < 0.01 for all values; paired t test for within-dosage groups). With exception of AA, fatty acid changes from baseline, in general, were higher in the Omacor 8-g group (Table 2). EPA/AA ratios also were significantly increased in both treatment groups and were higher at both 6 wk (P = 0.002) and 6 mo (P = 0.001) in the Omacor 8-g group (Table 2). 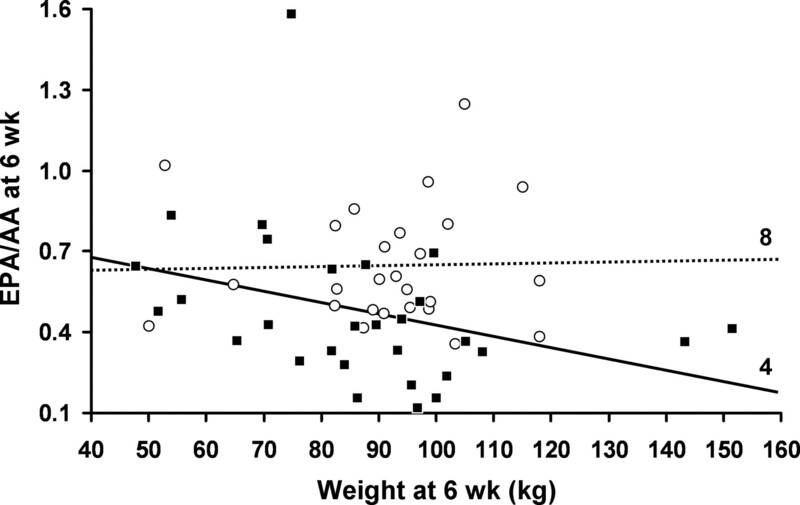 Because of the small, insignificant variations between baseline, 6-wk, and 6-mo values for all parameters studied, we chose to express the remainder of the correlations using 6-wk treatment values for body weight, BMI, plasma PUFA, and Omacor dosage per kilogram of body weight. Changes in plasma phospholipid fatty acid profiles were associated with body weight and BMI (Figures 1 and 2). The levels of EPA, DHA, and EPA/AA ratios were significantly inversely correlated with increasing weight (Figure 1) and BMI (Figure 2) in the Omacor 4-g group. There were no significant changes in any of the ω-3 fatty acids in the Omacor 8-g group (Figures 1 and 2). AA levels did not change significantly in either Omacor dosage group by body weight but increased significantly with increasing BMI in the Omacor 4-g group. Conversely, increasing levels of plasma EPA and DHA and EPA/AA ratios and insignificant decreases in plasma AA levels were observed with increasing dosages of Omacor (EPA+DHA) in grams per kilogram of body weight at 6 wk of treatment (Figure 3). A plateauing effect was observed after an Omacor dosage of approximately 0.07 g/kg body wt was reached (Figure 3). Plasma phospholipid arachidonic acid (AA), eicosapentanoic acid (EPA), docosahexanoic acid (DHA), and EPA/AA ratios (shown in figure) plotted against body weight in kilograms 6 wk after treatment with Omacor 4 (▪) and 8 g/d (○). For the 4-g group, the levels of EPA (r = −0.46, P = 0.01), DHA (r = −0.40, P = 0.03), and EPA/AA ratios (r = −0.48, P < 0.01) were inversely correlated with weight, whereas AA was not significantly correlated (r = 0.31, P = 0.11). For the 8-g group, there were no significant correlations of body weight with any of the ω-3 fatty acids (all r < 0.11, all P > 0.10). Spearman rank correlation coefficient (r) was used in the analysis. Plasma phospholipid AA, EPA, DHA, and EPA/AA ratios (shown in figure) plotted against body mass index (BMI; wt [kg]/ht [m2]) 6 wk after treatment with Omacor 4 (▪) and 8 g/d (○). For the 4-g group, the levels of EPA (r = −0.51, P < 0.01), DHA (r = −0.40, P < 0.01), and EPA/AA ratios (r = −0.54, P < 0.01) were inversely correlated with BMI, whereas AA was positively correlated with BMI (r = 0.41, P = 0.03). For the 8-g group, there were no significant correlations of BMI with any of the ω-3 fatty acids (all r < 0.17, all P > 0.10). Spearman rank correlation coefficient (r) was used in the analysis. Plasma phospholipid AA, EPA, DHA, DHA+EPA, and EPA/AA (shown in figure) ratios plotted against Omacor dose (g/kg) 6 wk after treatment with Omacor 4 (▪) and 8 g/d (○). The levels of EPA (r = 0.51, P < 0.0001), DHA (r = 0.35, P < 0.01), DHA+EPA (r = 0.48, P = 0.0002), and EPA/AA ratios (r = 0.50, P < 0.0001) increased significantly with increasing dose of Omacor. The plotted line is a smoother (running average) and identifies a plateauing effect at a dosage of approximately 0.07 g/kg. AA level decreased insignificantly (r = −0.25, P = 0.07) with increasing dosage of Omacor. Spearman rank correlation coefficient (r) was used in the analysis. None of the plasma ω-3 PUFA levels or EPA/AA ratios was significantly correlated with annualized rates of change in renal function (1/serum creatinine slopes) or proteinuria (UP slopes) during the 2-yr treatment period (data not shown). Likewise, there was no significant correlation between Omacor dosage per kilogram of body weight at 6 wk of treatment and annual rates of change in 1/serum creatinine and 24-h UP (“slopes”; Figures 4 and 5). Annualized rate of change in renal function in 72 patients who had IgA nephropathy according to Omacor dosage per kilogram of body weight at 6 wk of treatment. The annual rates of change (slopes) for reciprocal serum creatinine were computed for each patient (+) by linear regression analysis using all results before renal failure (if present). Spearman rank correlation coefficient was r = 0.06 with P = 0.62 (no significant linear trend). Annualized rate of change in proteinuria in 68 patients who had IgA nephropathy according to Omacor dosage per kilogram of body weight at 6 wk of treatment. The annual rates of change (slopes) for 24-h urine protein were computed for each patient (+) by linear regression analysis using all results before renal failure (if present). Spearman rank correlation coefficient was r = 0.16 with P = 0.18 (no significant linear trend). The three tertiles of Omacor dosage per kilogram of body weight were not significantly different regarding baseline levels of creatinine (median 1.8, 1.9, and 2.1 mg, respectively; P = 0.49), hypertension (61, 38, and 71%, respectively; P = 0.06), and urine protein (1.7, 2.2, and 1.3 g/24 h, respectively; P = 0.11). The effect of Omacor dosage per kilogram of body weight tertiles (linear trend) on UP and reciprocal serum creatinine slopes and on survival free of ESRD at 5 yr showed no significant differences (Table 3, Figure 6). Upon adjustment for baseline creatinine, hypertension, and UP using regression analysis, the lack of an association remained: UP slope (P = 0.24), reciprocal serum creatinine slope (P = 0.61), and risk for ESRD (P = 0.16). Cumulative percentage of patients who had IgA nephropathy and were free of ESRD according to Omacor dosage per kilogram of body weight tertiles at 6 wk of treatment; Cox proportional hazards model testing the association of ESRD with Omacor dosage per kilogram of body weight as a continuous variable, P = 0.16. This post hoc analysis of body size measurements, plasma ω-3 PUFA status, and renal outcome did not confirm the previous findings in the re-analysis of the North American IgA Nephropathy Study that treatment efficacy of ω-3 PUFA is dosage dependent on the basis of body size (9). Our findings, using the same ω-3 PUFA product (Omacor), showed no significant associations between changes in renal function and proteinuria at 2 yr and time to ESRD at 5 yr and plasma ω-3 PUFA levels or Omacor dosage per kilogram of body weight. The differences in outcomes between our study and the North American study could be explained on the basis that (1) different patient populations were studied (adults in our study versus children and young adults in the North American study); (2) disease severity was different (severe in patients in our study versus mild to moderate in patients in the North American study); (3) there was a small number of patients in this study, limiting the statistical power; and (4) the possibility that the relationship does not exist (i.e., a false-positive finding in the North American study). In our study, in the evaluation of two parameters of body size—weight and BMI—for the Omacor 4-g dosage of ω-3 PUFA used, patients of bigger size had decreasing levels of plasma ω-3 PUFA, whereas there was no significant change in levels in patients who received the Omacor 8-g dosage of ω-3 PUFA. In turn and as expected, larger dosages of Omacor per kilogram of body weight were associated with increasing levels of plasma ω-3 PUFA, yet higher levels of plasma ω-3 PUFA and larger Omacor dosage per kilogram of body weight did not correlate with improved renal function, proteinuria, or renal survival. Intuitively, if the hypothesis that better treatment efficacy is achieved by ω-3 PUFA dosing on the basis of body size is correct, then patients who were assigned to the high-dosage Omacor group (8 g) should have had a better renal response than those who received low-dosage Omacor (4 g) in our randomized, two-dosage comparative trial (6) because there were no significant discrepancies in weight or BMI between groups. In our report of this trial, we found that low-dosage and high-dosage Omacor treatment was similar in slowing the rate of renal function loss in high-risk adult patients with IgA nephropathy, suggesting perhaps a threshold of efficacy of <4 g of Omacor (EPA 1.88 g, DHA 1.47 g). In fact, a lower effective dose of ω-3 fatty acids has been reported in the treatment of patients with IgA nephropathy. In a recently reported randomized trial (7), the fish oil group received a daily dosage of EPA 0.85 g and DHA 0.57 g and had significantly better preserved renal function and lower urine protein than the control group. The patient cohort was said to be at high risk for progressive renal disease. In our original randomized, placebo-controlled, clinical trial that tested fish oil in IgA nephropathy (4), patients who received fish oil supplementation that contained EPA 1.8 g and DHA 1.2 g had a decrease in the proportion of ω-6 eicosanoid precursors (C20:3ω6 and C20:4ω6) in total plasma phospholipids in a significant and sustained manner (13). The rationale for using fish oil in IgA nephropathy is based on the premise that the net effect of ω-3 fatty acids on eicosanoid production, evoked by the initial immunologic renal injury, changes the hemostatic balance toward a more vasodilatory state, decreases platelet aggregation, and reduces mesangial cell proliferation and contraction (14). This dosage of ω-3 fatty acids reduced the risk for a 50% increase in the serum creatinine concentration, the primary end point, by 82%. Treatment also lowered the risk for death or ESRD by 67%. 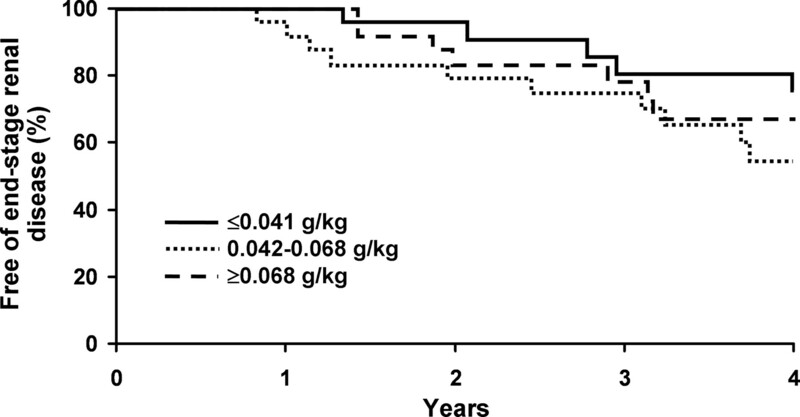 These renal failure end points related to the levels of ω-6 eicosanoid precursors, with lower proportions maintained in the fish oil–treated group, who also had more favorable renal outcomes. Our study has several limitations. It spans a narrow range of Omacor dosages per body weight (0.02 to 0.15 g/kg, with much of the data clustered at approximately 0.04 and 0.08 g/kg because of the original randomization), because it was not designed as a pharmacokinetics study. Furthermore, given the negative findings of this study, it is important to consider the statistical power to detect an effect, should it exist. The primary end point was time to ESRD. With 26 ESRD events, the study had 80% power to detect a dosage-per-body-weight hazard ratio (ESRD rate above versus below median dosage per body weight) of 0.33 or lower, corresponding to being able to detect a difference in 5-yr ESRD-free rates of approximately 25 percentage points (e.g., 60 versus 85%). With 73 patients, true correlations between quantitative factors (e.g., reciprocal serum creatinine slope and Omacor dosage per body weight) as low as 0.32 could be detected with 80% power. That we did not find an inverse relationship between blood levels of long-chain ω-3 PUFA and renal outcomes does not take away from our findings that the composition of ω-3 PUFA, which contained EPA 1.88 g and DHA 1.47 g, efficiently enhanced the EPA and DHA and total ω-3 PUFA content of plasma phospholipid (11,13) and can be recommended on the strength of the findings that fish oil supplementation retarded the rate of renal function loss in patients as reported in our two clinical trials (4–6). However, one could argue that there is a lower threshold effect than with a dosage of EPA + DHA of approximately 0.07 g/kg body wt (Figure 3), and future trials should consider studying the efficacy of very-low-dosage omega-3 fatty acids with appropriate pharmacokinetic measurements in patients with severe IgA nephropathy. This work was supported by an unrestricted grant from the Brian G. Dyson Foundation (Atlanta, GA) and grant R01 DK 55603 from the National Institute of Diabetes and Digestive and Kidney Diseases. We thank Cherish Grabau for excellent secretarial assistance. You are going to email the following Is Body Size a Biomarker for Optimizing Dosing of Omega-3 Polyunsaturated Fatty Acids in the Treatment of Patients with IgA Nephropathy?